Years ago, I developed an interest in the Japanese art of dwarfed potted trees, bonsai. I bought some books on the subject by Brooklyn Botanic Garden. In oneHandbook on Bonsai: Special Techniques (seventh printing, February 1976)the type was bad. Old worn lead type, I suspect, spread wide in the tops of characters and disappearing at the bottoms. Two decades later, I came across the handbook and was struck again by this interesting type. Inspired, I made a typeface. Didn’t take me long to decide on a name for it, either: a name with a double-meaning, based both on its look and its inspiration. 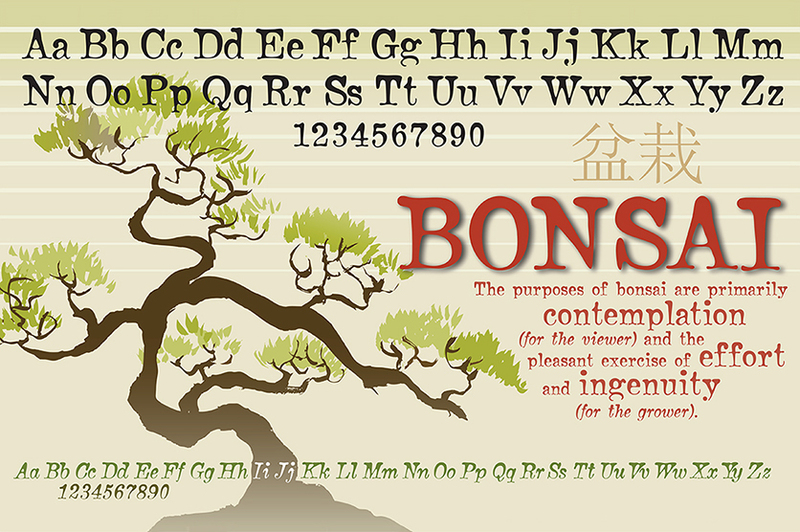 Bonsai has two styles, a roman and a true italic. US$49.